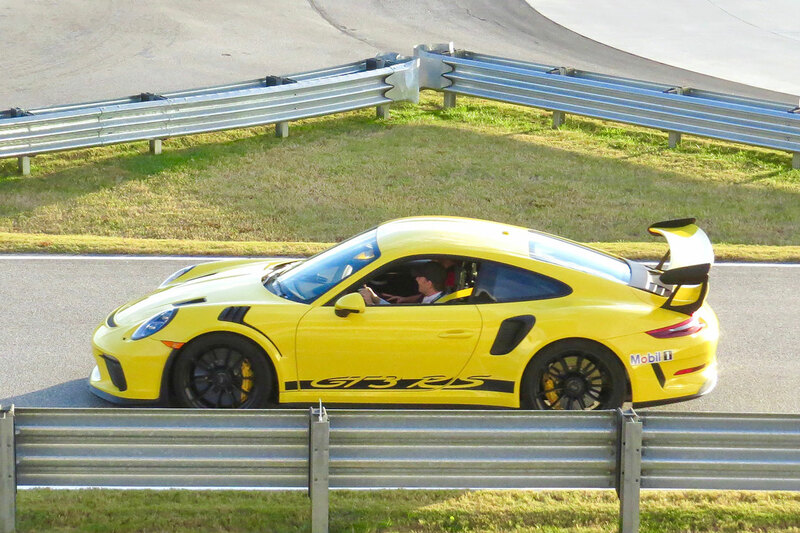 Above: The author drives a 991.2-gen 911 GT3 RS at the Porsche Experience Center in Atlanta. My week began riding Ducati’s new 226-horsepower Panigale V4S, with its Moto GP-derived V4 engine shoe-horned into a 436-pound chassis. Sporting a power-to-weight ratio better than an F1 car, the urgency of this piece of machinery has my deepest respect, as it instantaneously reached triple-digit speeds. Knowing in just days I would be visiting the Porsche Experience Center (PEC) in Atlanta to do back-to-back drives of the company’s latest 991.2 GT3 and GT3 RS, in what is called the “GT Academy,” I pondered the street-legal potency of the ride I was on and how the Porsche products would compare. Not in a directly competitive way, but, after all, the Panigale and Porsche’s GT cars are street-legal track weapons meant to homologate purebred race machines. As with any story like this, a writer should always ask who the reader might be, who might gain something by reading along. Well, if you are getting one of these GT cars new, you either already have it, or you’ve already been allocated one and it will be along shortly. If this isn’t you, you are possibly getting ready to write an even bigger check for one via the secondary market. If you don’t fit either of these scenarios, I think you’ll find my ultimate conclusion satisfying, so hang in there. For all of the performance I would be enjoying, due to the remnants of hurricane Michael, my flight from Virginia to Atlanta was delayed both on the ground and in the air. After landing, matters didn’t get better. My driving appointment was at 2 PM, and having arrived at Hartsfield-Jackson airport at concourse D, I found the Plane Train shuttle to the main terminal completely out of service. I’ve since calculated the walk I made along with a million other weary passengers as being about 4,900 feet — nearly a mile! This was not including the distance from the gate itself to the dead shuttle. Thus far, so much for a trip focused on going fast. Above: 991.2 Porsche 911 GT3 that Neel drove at PEC. Out first in the GT3, I asked Kyler if the 991.2 GT cars received a unique suspension setup for use at PEC. He shared they did not, but the previous 991.1 GT3 and RS versions did. That tells you something right there. I had done a somewhat back-to-back comparison of the 991.1 and new 991.2 GT3s earlier in the year and the differences were noticeable. The new GT3 also chopped 12 seconds off the old one’s Nürburgring lap time, which is very close to a 1-second-per-mile reduction on the 12.9-mile Nordschleife circuit. Applause and bows to the folks at Weissach. Behind the wheel, I unexpectedly exploited the wet track conditions by wagging the GT3’s tail in a pucker-factor moment on the tightest part of the track. This brought praise from the passenger seat, and netted confidence in the GT3’s trusting abilities to gather it up in the wet. 30 minutes later another driver was not as fortunate. Ah, we’ll need your credit card sir! With my refresher in the GT3 behind me, next up was the GT3 RS, nicknamed “Goldie.” I can share that having your foot on the floor of either is blissful. But Goldie, at 9000 rpm, with the PDK dual-clutch semi-automatic transmission shifting from second to third, is otherworldly. It gobbles up tarmac at a ferocious rate while conducting a naturally aspirated, internal-combustion symphony. Frankly, both let out a cry from the automotive gods, but the RS has less sound deadening and that equates to increased volume. Porsche has ironically created the most pleasing induction sound right as the company prepares to thrill us with silence with the electric Taycan. Using launch control on the damp surface, the RS was torn between a spin-cycle and asphalt removal as it tried to find grip. But this is where my story takes a twist. While a wet track is better than no track, a dry one would allow me to more comfortably exploit the car’s capabilities. And as it turned out, I would be revisiting PEC just a couple of weeks later for another event. Brian graciously invited me to re-drive the RS. I was very appreciative. So, back at PEC on a dry day, I can share the previously mentioned launch sequence went very differently. Kyler and I became human bullets as the RS, also armed with ceramic-composite brakes (PCCB in Porsche speak), accelerated from zero to 85 miles per hour and back to zero in about 600 feet — netting nearly 0.70 g under braking. We deposited about 25 feet of rubber under acceleration and I suspect at least as much as we came to a stop. Above: Performance metrics displayed on the center screen. Now, one must understand something about the circuits found at PEC. While the asphalt compound itself is not some special race track blend, there are few surfaces anywhere with as much high-quality rubber deposited from constant use. Five days a week, all day long, only high-performance rubber mounted on new, leak-free Porsches going relatively fast meets the road. Expensive Michelin Pilot Sport Cup 2 tires are only lasting a few hundred miles, and thus the surface’s grip is plentiful. Being able to have time in the GT3 RS in both wet and dry conditions was eye-opening to its edge over the GT3. A comparison begins with specs on paper, where the seemingly minor numeric differences between these two cars do not do justice to the RS. There’s just a 20 horsepower and 7 pound-feet of torque advantage found in the RS (520 hp and 346 lb-ft). But as the saying goes, the devil is in the details. Where the GT3 is amazing, the RS is magical, the most trusting fast car I have ever driven, wet or dry. An essential ingredient in its focused abilities is perfect throttle response. Absent is the sharp, on-off characteristic found in other high-performance sports cars, which may seem counterintuitive. In fact, smoother and more incremental throttle programming allows drivers to more easily make judicious throttle corrections without upsetting the balance of the car. The comparative feel between the GT3 and RS was especially heightened in reality on PEC’s wet skid pad, where throttle modulation is ever important. This combined with the RS’s torque advantage is blissful and matched perfectly to Porsche’s intuitive PDK transmission. The only abruptness comes when you floor the throttle and unleash its stable of horses. But once the first second or so passes, the stampede is joyfully inspiring and the subsequent braking equally so. Back to the spec sheets, you’ll find a slightly better power-to-weight-ratio, but perhaps the most notable feature hidden in the numbers is the track width of both vehicles, with the GT3 having a 61.1-inch front and 61.2-in rear widths, compared to the GT3 RS’s 62.5 (F) and 61.3 (R). This wider front than rear no doubt made navigating a damp slalom easier, aiding the excellent four-wheel steering system fitted standard to GT Porsches (an option for the Carrera T, S, and GTS models). The RS’s agility and reassuring ability to go exactly where you steer makes it a happy and willing dance partner. So while both of these new GT3s are improved, driving them back-to-back really emphasizes the RS’s edge. Yet the context offered by the sheer variety of Porsches on hand brings me to what may be a more enlightening comparison, the one between these two top-shelf GT cars and their less-expensive counterparts, the Carrera S, 4S, and even the Carrera T. With Kyler at the wheel of the GT3 RS, I experienced it being driven to its full potential. Like the GT3, it offers more performance than most of us could ever extract from it, which was acutely illustrated by back-to-back rides with Kyler at the wheel of the Carrera S and his fellow driving coach Justin Webb — a Hollywood stunt driver — in a 4S. What did they prove? That one doesn't need to look to Porsche's GT cars to find scintillating performance — every Porsche 911 offers that to skillful drivers nowadays. Which has me turning to my theory of Need, Have, and Want. If you need any of the cars I am referring to here, perhaps there are some priorities out of order. If you have any of them, you have reason to be very happy. But if you want any of them, be honest with yourself in what you are seeking, as all of them offer greatness in varying degrees of your performance intent. All three of Porsche’s most recent 911 GT cars, the GT3, GT3 RS, and GT2 RS, deliver levels of performance far past what’s reasonable and legal on the street, and so we customers can only be left with a few reasons to own them. Reason #1: GT stands for Grand Testosterone. Their specs are so great, we feel greatness by association. Driving and owning a GT car is like having Hurley Haywood, Timo Bernhard, Sabine Schmitz, and Mark Webber as best friends. This can easily be worth the price of admission. Reason #2: GT stands for Grand Therapy. Perhaps what these products do best is deliver a form of therapy. When we all look in the mirror, lord knows seeing a faster version of ourselves can’t hurt. Reason #3: GT stands for Grand Touring. It really does, as in GT-class racing. The GT3 RS homologates the RSR for professional racing, making it the ultimate street-legal track car. The problem with this theory is that these are not really race cars, and have almost become too expensive and sought after to use on track. I refer you Kris Clewell’s story and accompanying video, “Street versus Race” in Porsche Panorama’s issue #739. In the article they timed laps at Road America to compare the 700-hp GT2 RS against a 460-hp GT3 Cup. Now, I think the test itself was somewhat biased, in that the Cup car was completely set-up for their Road America test track and on slicks versus the factory set-up of the GT2 RS on street tires. But even if they had equalized these points, the conclusion would remain the same: The Cup car would still be faster. If you have around $300K to spend on a GT2 RS — or a GT3 RS, for that matter — and you plan on tracking it, purchasing a GT3 Cup, which is a real race car, for way less could be a much smarter way to go. Reason #4: GT simply stands for Grand Time. You have the money and want the ultimate Porsche, and you want to enjoy driving it on the street and/or track. In the process, you’ll likely stay ahead of the depreciation curve, too. To that, I say, the new GT3 is worth every penny, the GT3 RS is a pot of gold, and the GT2 RS is priceless! Which in closing brings me back to the PEC’s GT Academy. Attending the $850 GT3 course first was a prerequisite, and the GT Academy’s $1,250 price tag is not cheap. It is, however, the bargain-priced way to experience these brilliant products as they were intended. Full-throttle acceleration with launch control, navigation of a slalom course, and drifting on low friction surfaces — these are some of the most fun things you can do on four wheels. Plus, you won’t have to replace a set of Cup 2 tires for well over $2,000 or stress about damaging your own (or perhaps a friend’s) valuable possession. You will also be teamed with great coaches, be up to your ears in the Porsche Experience Center’s culture and lore, and — guess what? — you don’t have to own a Porsche to join in on the fun.